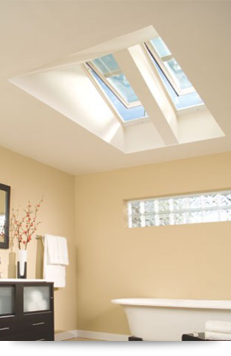 Bringing more natural light into your home with one or more skylights will make your rooms feel more spacious, expansive, and more beautiful, and there is no better way to “let the light in” than with a VELUX® skylight. Master Roofers' skylight division, "Skylight Masters" is a VELUX® certified 5-Star Skylight Specialist, and we proudly carry the complete line of VELUX® skylights, including SUN TUNNEL skylights, and accessories. With a reputation for quality, selection and trouble-free installation, we’ve helped a wide range of clients bring the many benefits of daylight and fresh air into their home or business. Visit our website www.skylightmasters.com to see our full line of products and services. Velux National Product Manager, Ross Vandermark, speaks about the Velux No Leak Solar Powered "Fresh Air" Skylight and some of the new features being integrated in 2014. Velux National Product Manager, Ross Vandermark, speaks about Velux SUN TUNNEL skylights and the Flexi Loc™ tunnel installation system, which significantly reduces installation time. Velux National Product Manager, Ross Vandermark, speaks about Velux blinds and the various options and styles now available.